Conference Facilities South Africa has a comprehensive list of conference venues and centres with conference facilities in the Namaqualand region of the Northern Cape Province in South Africa. The Namaqualand region of the Northern Cape in South Africa extends from the Atlantic Ocean in the west to the small town of Pofadder in the east, and from the great Orange River in the north to Garies in the south. The the arid summer months of this region contrasts the beauty of the yearly wild flower appearance that transforms the Namaqualand area completely. After the winter rainfall in Namaqualand the wildflowers invade the countryside for a brief moment. The Namaqualand is an arid region in the Northern Cape of South Africa. The region extends along the west coast for over 600 miles and covers a total area of 440,000 km². The Namaqualand region is divided by the Orange River into the Little Namaqualand to the south and Great Namaqualand to the north. Little Namaqualand forms part of Northern Cape Province of South Africa and Great Namaqualand forms part of the Karas Region of Namibia. 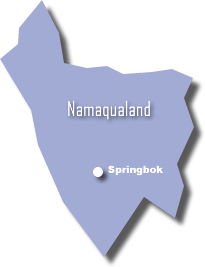 Great Namaqualand is sparsely populated by the Namaqua, a Khoikhoi people. The Northern Cape region of Namaqualand is a popular tourist destination during the early springtime. At this time the normally arid area becomes covered with a kaleidoscope of colour during the flowering season. This is known throughout South Africa as the Namaqualand daisy season, where orange and white daisies spring up from a previously barren site. The Namaqua National Park has been established to protect this unique phenomenon of South Africa.